Developer: BreakAway Games, Firaxis Games, Inc.
Sid Meier's Gettysburg! is a real-time tactical computer game designed by Sid Meier, the co-founder of Firaxis Games, that was released in 1997 by Electronic Arts. In 1998, Gettysburg won the Origins Award for Best Strategy Computer Game of 1997. 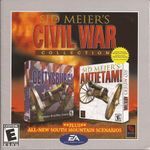 It was followed by Sid Meier's Antietam! in 1998. Source: Wikipedia, "http://en.wikipedia.org/wiki/Sid_Meier%27s_Gettysburg%21," available under the CC-BY-SA License. Sid Meier's Antietam! is a real-time tactics computer game designed by Sid Meier the co-founder of Firaxis Games, then was released in December 1999 by Electronic Arts. It is the sequel of Sid Meier's Gettysburg! The game allows the player to control either the Confederate or Union troops during the Battle of Antietam of the American Civil War. The game is very detailed and realistic. It can be played as a single scenario, or as a campaign of linked scenarios, either recounting the original history or exploring alternate possibilities. Source: Wikipedia, "http://en.wikipedia.org/wiki/Sid_Meier%27s_Antietam%21," available under the CC-BY-SA License.